Aratakara are enjoying summer in Japan. 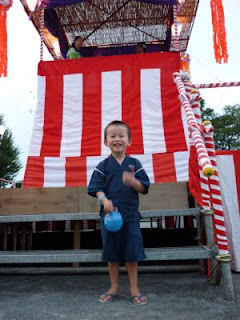 We went to Bonodori last Saturday. 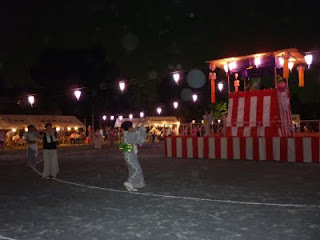 They tried candy floss and Ramune drinks, then did shooting and throwing hoops, fishing water balls. 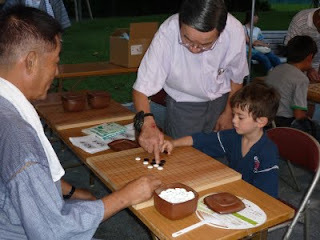 Bonjinkai, an Igo circle my father joins, also had a table. Arata tried one game. Takara is still interested in the drums and he wanted to play them and watched the drummers enthusiastically. Boys can dance 'Tanko bushi' because they learnt it at the kindergarten but they were too shy. 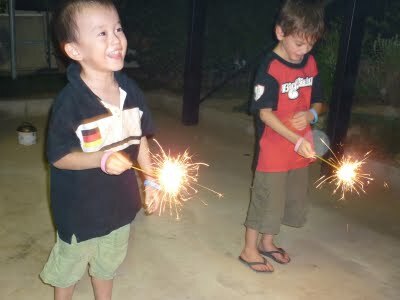 Yesterday, they did fire works for the first time.